Does your morning bagel need a fall makeover? Do you crave pumpkin cheesecake but don’t need the extra 1000 calories? Do you like quick and easy recipes that taste really, really good? If you answered yes to any of those questions, you’ll love this Pumpkin Spice Cream Cheese Spread! Now I can’t take all the credit for this idea. My friend Alexis sent me a message on Facebook suggesting that a pumpkin cream cheese spread for bagels would be a really great recipe for the fall. Hmmm…pumpkin cream cheese? I had never thought about it, but I know I love pumpkin cheesecake so it sounded like a good idea to me! 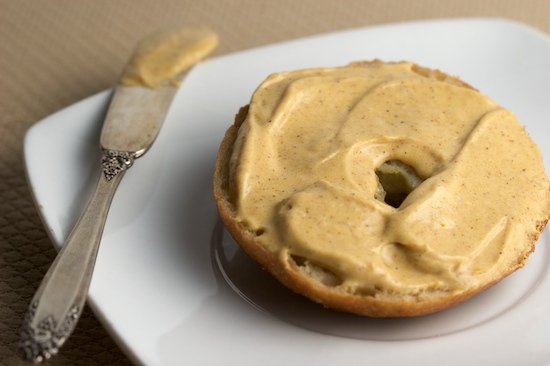 Since I happened to have canned pumpkin and cream cheese on hand, I threw together a couple of different combinations and quickly ended up with a delicious spread that works equally well on bagels and muffins. This morning as I was trying to think of other ways to use the spread, I decided that it might make a good dip for apple slices. And I was right! Since I still had a house full of guests this morning, I had plenty of apple tasters on hand. My cousin Corinne took a bite and her eyes got wide. At first I thought she didn’t like it, but then I heard, “Oooooh, it tastes like apple pie!” And we all agreed. I love it when friends request special recipes or give me suggestions. Some of my favorite creations have happened that way (remember Jason’s Ultimate Manwich?). So keep the ideas coming, guys! One of the great things about this blog is that it helps keep me connected with friends that might otherwise drift away. Being part of the military, we move around a lot and have met and left friends all over the world. While it is fun to meet new people, it can be difficult to keep in touch with them all. I met Alexis while volunteering at the weekly newspaper on the military base in Sicily. Alexis and her husband Ryan left the island a couple years before we did, but we ended up keeping in touch sporadically through e-mail and blogging. I think if we hadn’t all started blogging, we probably would have lost touch! I’m glad we did keep in touch because it was Alexis and Ryan who introduced me to Ben, the designer who created the latest blog design for Pinch My Salt. Isn’t the internet a wonderful thing? I haven’t seen Ryan and Alexis in person since they left Sicily and I’ve never even met Ben in person. But they’ve all helped contribute to this blog over the last couple of years! And speaking of Halloween, the Pumpkin Spice Cream Cheese spread would be a really tasty frosting on some pumpkin-shaped sugar cookies! A bit of red and yellow food coloring would turn it a nice shade of pumpkin orange. And now that I’m thinking about it, the spread would also make an excellent frosting for some Halloween cupcakes! I’m sure you’ll think of many other things to do with it, once you give it a try. Now we all know that sweetened cream cheese isn’t exactly a health food. But in small amounts, on a bagel or spread on some apple slices, this cream cheese spread can turn an ordinary snack into something really special, without the guilt associated with some of our other favorite treats. You could even try it with reduced-fat cream cheese, although I used the real thing. I really hope you enjoy it as much as we did. 1. In a small bowl, beat softened cream cheese, sugar, and syrup until smooth and creamy. That is definitely a bowl I would feel compelled to lick absolutely spotless! I've been wanting to try making homemade bagels before, and this cream cheese spread is just another reason I need to!! Although I could probably just eat it with a spoon and be happy! OMG! To die for....mmmm Nicole! Can't wait to try this. I could also dip Emma's graham cracker sticks in this. They are cinnamon flavor. I love Smack in his costume, too cute.. Thanks for the link to my blog! This cream cheese spread looks so delicious! I think I'll link it up from my blog! Have a great week! wow, that was quite a shout-out! thanks :-) and smack DOES look presh in his halloween costume!i'm planning a trip to the grocery store tomorrow, so i'll pick up the ingredients i don't have on hand and make the cream cheese. we're also having dinner guests tomorrow (i know - ME, with dinner guests! ha!) so maybe i'll see what they think! can't wait! ok, this makes me want to try and make bagels. like, now!!! I bet this is what they eat at Hogwarts for breakfast...at least it's what I would eat if I was a witch or wizard or such. Or maybe I'll just eat it anyways! Yum! I will def. have to try this!!! Since you are military..have you lived in the south? I've got a yummy southern casserole on my blog..check it out sometime..
Oooh I have been in the mood for some pumpkin cheesecake, but lack a springform pan (and as my tiny apartment kitchen just about reached maximum capacity with the addition of a couple of skillets, it doesn't look likely that I'll get one soon). This looks amazing! I'm on my yearly pumpkin kick now. The other day I even stopped at Starbucks *gasp* for a Pumpkin Latte. It was soooooooo good. Very cute puppy. i love the sweater. I will try out the recipe. Wish I had all of the ingredients here right now to try it. Love pumpkin pie, and pumpkin empanadas, too. Yummy. Just perfect for the fall season. Pumpkin cream cheese? Sign me up for this: it's quite inspired. Yum, two of my favorite flavors - cream cheese and pumpkin - in one! I can't wait to try it out. Hey, you made it onto the kitchn! Congrats! Oh my, I'll be trying this one! This cream cheese spread was SO GOOD! I am not a huge pumpkin lover and I loved it. I need to come visit again....I love reaping the rewards of your hard work in the kitchen! Oh, so good. Can't wait to make this. I love all things pumpkin, so this has me drooling. Fall is my favorite time of the year just because of all the pumpkin flavored foods. Yeah...so having been heavy on cream cheese and bagel for some time now, I'd recently decided I'd go easy on that.But now...that's all ruined. I can almost taste this thing. Mm mm mm. Sounds lovely! With your recipe as inspiration, I plan to combine the pumpkin butter with the cream cheese I have on hand. I live in Maryland and at this time of year you can get some wonderful apple butter and pumpkin butter spread from the farmer's markets. It might be a simpler alternative since the seasoning is already done for you. Just mix, spread, and enjoy! Pumpkin pie on a bagel - that works for me! My husband is going to love this. Perfect idea! My kiddo is a bagel fanatic and a pumpkin bread fanatic as well, so I think this one would please him very much! Wow! 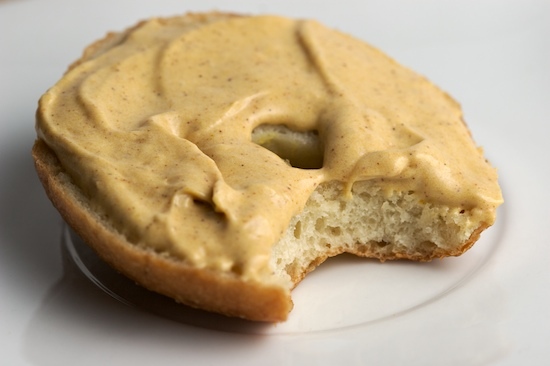 I didn't think my bagel needed a makeover until I saw your pumpkin spice cream cheese spread. It's time for a change. Is pumpkin pie spice something you buy with other spices? I've never heard of it before.How is it without the maple syrup? Not nearly as good? I don't use maple syrup at home, so I'd like to avoid buying a whole bottle for just this one recipe if I can avoid it. YUM. I bet this would be good on gingersnaps for dessert, too. Looks yummy Nicole:) And by the way..just bought baby Ian a shirt like Smack's. Would be cute have a pic of both of them together with it. heehee. Looks delicious! I may have to bust out my bagel-making skills this weekend and whip some up to go with this! I think I need this. Like, now. Any clue how long this might keep in a tupperware container in the fridge? About a week or so, maybe? I'd love to make this for breakfasts before the commute in to school, but it's just me and my dad, so I don't think we'd eat it all in one go like you did! MMM, this sounds great! I think I might whip this up this weekend. I think for an apple dip, I'd mix it with some light yogurt to lighten it up a bit. I hope I can get to the grocery store soon! Thank you for giving me a plan for this weekend's breakfast! This is the first recipe I've ever "stumbled upon" that I actually decided to actively GO TO WALMART and buy all necessary ingredients. I made a double batch, and since I live in a college dorm room, I split it into 4 small containers and shared with my friends.. it was freaking amazing! Thanks so much! This looks ridiculously amazing!!! Can't wait to give it a try!Blessings! This looks so good. I can't wait to make it. I am making this tonight and posted your link for this recipe in my daily blog feature today called the Daily Blend. I love pumpkin (and cream cheese) -thanks! Oh, mah Gawd. That looks sinful. Well done, and THANK YOU for sharing! I wanted to let you know that for days I was drooling over this very luscious sounding spread. It was necessary to make this spread as soon as possible. Having now done so, I wanted to tell you that I blogged about my experience at my brand new blog called Popcorn Cook. 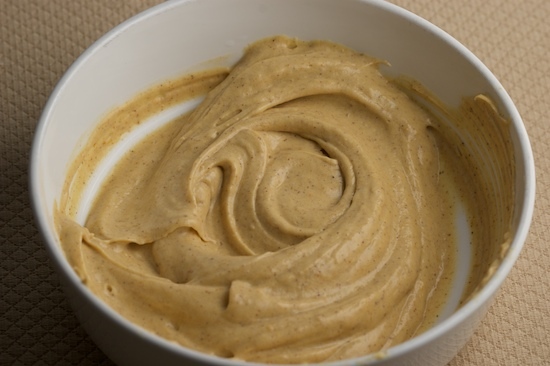 Perhaps you will understand why I don't say too much here:Pumpkin Cream Cheese Spread--A Semi-Disaster http://popcorncook.com/2008/10/07/pumpkin-cream-cheese-spread-a-semi-disaster/I could use all the readers I can get!!! Yes, I am shamelessly promoting my new blog but I really wanted to share my....er, experience. The spread is really fantastic..in normal amounts. I made this last night and had it this morning on toasted bagels. It was yummy! Came out a little softer than I expected, even after chilling overnight, perhaps because I used nonfat cream cheese. But terrific nevertheless! I just love pumpkin and look forward to the fall when there's so many yummy pumpkin recipes and foods. I am definitely going to try this! My roommate is absolutely obsessed with pumpkin-flavored things and when I found this through stumble, I immediately decided to make itand it was just about the most fantastic thing I've ever tasted, and I'm not even that big on pumpkin stuff. Thanks!! I just finished making this! It's fabulous! I'm obsessed with fall flavors these days, and this pumpkin spice cream cheese sounds amazing! Can't wait to try it out on some fresh New York bagels! Oh how I love fall! I love creative ways to incorporate the soul comforting feelings of fall flavors in my food. Yum, yum. This sounds so good, got to try it out over the weekend, I found a jar of Trader Joe's pumpkin butter in the fridge, I think this might work well too mixed with the cream cheese. I will make sure I listen on Wednesday. I made this cream cheese and while my family liked it it was much too sweet for my taste. I put it on a bagel along with the same amount of normal cream cheese and I liked it much better. If I made this recipe again I would use probably twice the cream cheese and half the maple syrup (or maybe even less). That sounds delicious, will have to try it - thanks for sharing! this looks absolutely amazing, can't wait to try it! I just made this it is delicious thank you so much for the recipe it will be a family staple now! That's a great idea...Love your website! Wow! I just made this and really don't want to wait for it to chill in the fridge for an hour. It's going to make for a yummy addition to my morning bagel! : ) Thanks again Nicole! Many people don't realize this because they haven't gone through it yet. I believe everyone will see how important this subject is soon enough. This looks fabulous! I would love to try this recipe out! This is the first recipe I’ve ever “stumbled upon” that I actually decided to actively GO TO WALMART and buy all necessary ingredients. Hey that you simply a great deal for the post, it was really and beneficial examine! I'll be again afterwards for sure. Just finished making the Pumpkin Spice Cream Cheese. It is really to die for. I used the whipped cream cheese and it worked out fantastic. It was so easy and tasted good (I did lick the bowl). I made this and we ate it on slices of pumpkin bread! It was awesome! Love this recipe. Used it tonight As a filling for my Atumn Pumpkin Cupcakes. It made the perfect filling... Texture is great inside the cupcakes! Thank you. 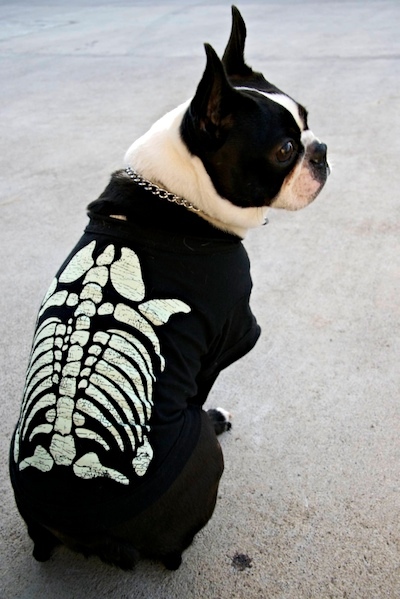 Love the little Boston in his costume. Wow! I just made this and really don’t want to wait for it to chill in the fridge for an hour. You definitely nailed this one. I had an inner battle to put the spoon down, I didn't even put it on the bagel yet lol. How long will this keep in the fridge? Thank you for the recipe.